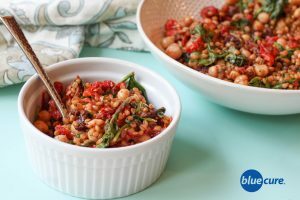 Slightly sweet, yet slightly tangy; this wheat berry salad is a delicious combination of spices, flavors, and textures. 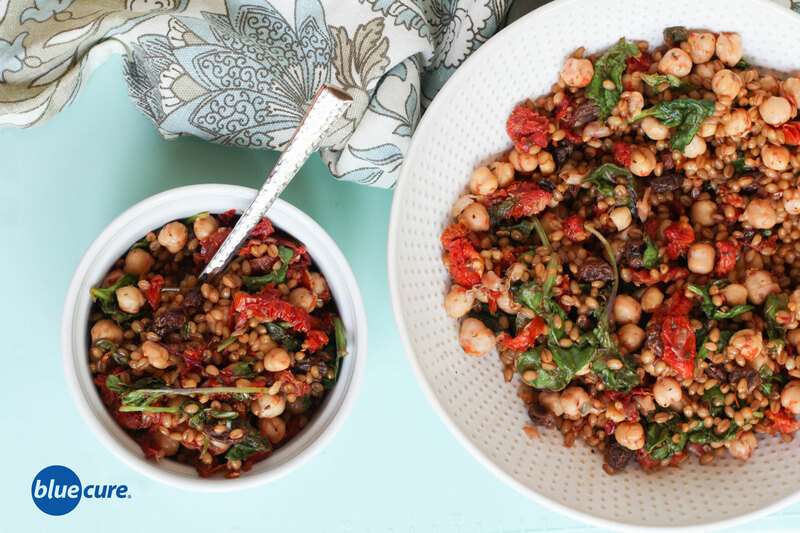 It combines chewy wheat berries with chickpeas, raisins, sundried tomatoes, spinach, lemon juice, and spices. Serve it warm on a cool day or serve it chilled on a hot day; both ways are great! Wheat Berries are a hearty, whole grain that have a nutty taste and chewy texture. Not only are they a great source of fiber (6 grams per ¼ cup uncooked), but they also have as much protein as a serving of quinoa (7 grams per ¼ cup uncooked)! Rinse the wheat berries. In a large pot, combine the wheat berries with 4 cups water. Bring to a boil and then reduce the heat. Cook for about 45-50 minutes or until tender. If there is extra liquid on the wheat berries, drain off. Add the raisins, sundried tomatoes, and 1 tablespoon of water. Cook lightly, then add in the lemon juice, chickpeas, spinach, garlic powder, thyme, and black pepper. Stir until well combined and the spinach has wilted down. Taste the salad. If needed, add more spices or optional to add in 1 tablespoon of tomato paste.